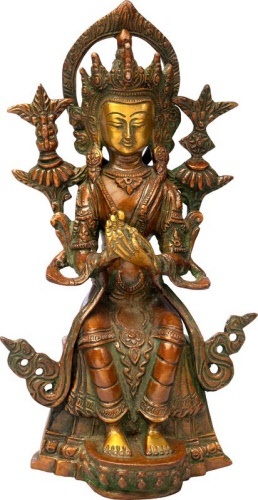 This beautifully handcrafted statue made in India by master craftsmen and women. The Hindu god Shiva in this form is known as the cosmic dancer. The most common images show him with four arms and flying locks, dancing on a dwarf (a symbol of human ignorance) and encircled by a ring of flames. 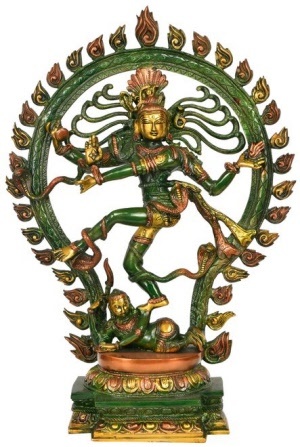 The Nataraja sculpture shows Shiva as the source of all movement within the cosmos, represented by the loop of flames. The dance's purpose is to release humans from illusion; the place where the god performs the dance is believed to lie both at the centre of the universe and within the human heart. The upper right hand holds a hour-glass drum which is a symbol of creation of the universe. The opposite hand, the upper left, bears on its palm a tongue of flames. (Symbolising destruction of the universe) The second right hand is held in the abhaya pose (literally without fear) and so a gesture of protection, as an open palm is most likely to be interpreted. It depicts the god as a protector. The left leg is raised towards the right leg and reaches across it; the lower left hand is stretched across the body and points to the upraised left foot which represents release from the cycle of birth and death. The ring of fire and light, which circles the entire image, identifies the field of the dance with the entire universe. The lotus pedestal on which the image rests locates this universe in the heart or consciousness of each person. Hand crafted in India and now available to you. Each one is made with much love, care and respect by Buddhist craftsmen and women. Maitreya, also known as the future Buddha, who has still to come. According to some traditions, the period of the Buddhist Law is divided into three stages: a first period of 500 years is of the turning of the Wheel of the Law; a second period of 1,000 years is of its deterioration, and the third period of 3,000 years is the one during which no one practices the Law. After this, Buddhism having disappeared, a new Buddha will appear who will again turn the Wheel. This future Buddha is known as Maitreya. A beautiful statue made in India by Buddhist's with much care and devotion. 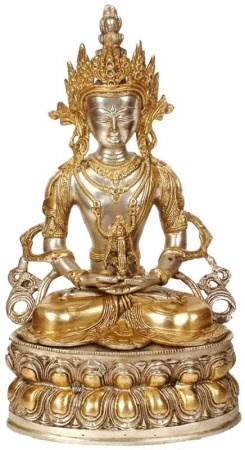 This Buddha would be a great addition for the collector or for a Temple, shrine or home altar. he practiced dilligently and realized enlightenment and became a Buddha.